CJ Outfitters is a premier Colorado Outfitter and Guide offering trophy elk, deer, and pronghorn hunts on 4 of Colorado?s top trophy areas. 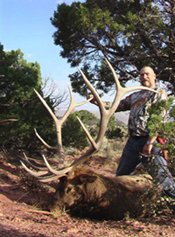 As an elk guide, Chris has taken some of the top trophies out of units 1, 2, 10, and 201. Just a look at the photos below shows what he has been able to do for his clients. Drawing and elk permit in either of these areas can take many years, but the wait is well worth it. Chris understands what has been put into drawing one of these permits and puts and enormous amount of effort into each hunt to insure that his client goes home with a trophy of a lifetime. Over the years, he has built and maintained a near 100% success rate on trophy bulls in these units. 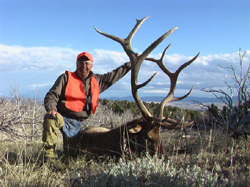 CJ Outfitters is not only a trophy elk guide, but also an exceptional deer guide and pronghorn guide as well. Units 1, 2, 10 and 201 also produce some of the best mule deer and pronghorn Colorado has to offer. Drawing a permit for either of these species is also very difficult and typically takes many years of commitment before it actually happens. But once a permit is in hand, selecting the right outfitter is vital if one wants to maximize the opportunity for success with the best possible trophy. Chris hunts these areas by 4x4 and 4-wheeler taking hunters into areas that have been previously scouted and potential trophies located. The vast knowledge and experience Chris has developed over the years increases the probability that the hunter will be presented with an opportunity. It is usually not a matter of if a hunter will get an animal, it is more of which one will he choose and when will the big one present a shot. For any hunter holding a unit 1, 2, 10, or 201 deer, elk or pronghorn permit, Chris Jurney of CJ Outfitters has to be a serious consideration when selecting a guide. Check out their website at CJ Outfitters or contact Hunters Trailhead for more details.